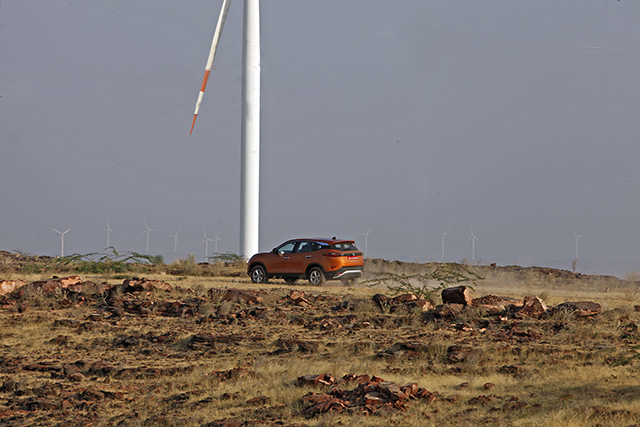 The Tata Harrier is based on Land Rover’s D8 architecture, is powered by Fiat’s popular 2.0-litre diesel engine and sports Tata’s radical new Impact Design 2.0 styling. We saw a glimpse of it in the form of the Concept H5X shown at the Auto Expo 2018 and many funky elements from the concept have made it to the production model. 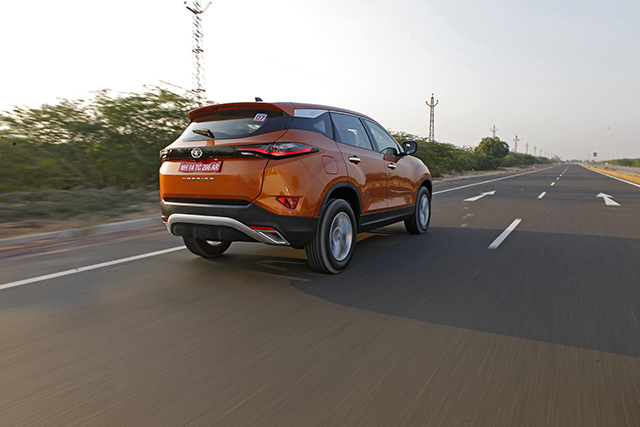 The Harrier has bits and traces of not just the H5X, but even the Nexon and the Discovery Sport which is also based on the same D8 platform. 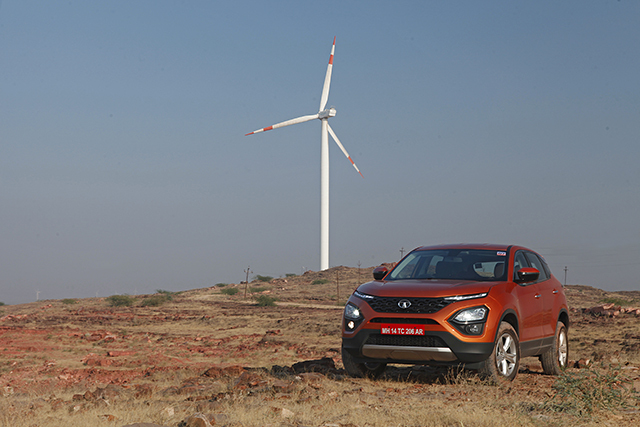 For instance, the razor sharp headlamps of the Concept H5X have been converted into DRLs on the Harrier for practicality. The much larger Xenon projector headlamps are unusually positioned – under the DRLs and integrated into the front bumper. 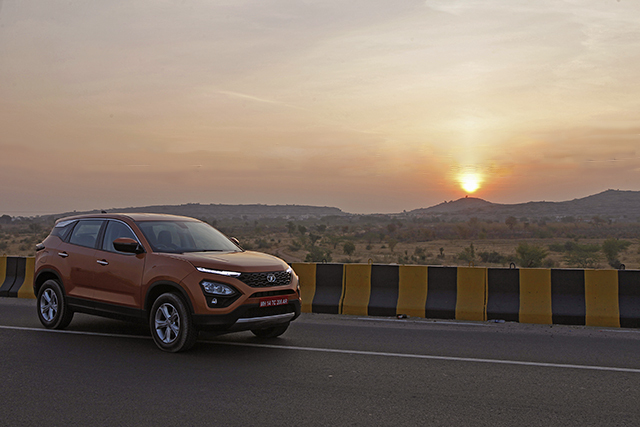 Tata Motors’ design head, Pratap Bose explained that the gloss black ‘Humanity Line’ grille design has evolved from the Tiago and Nexon. 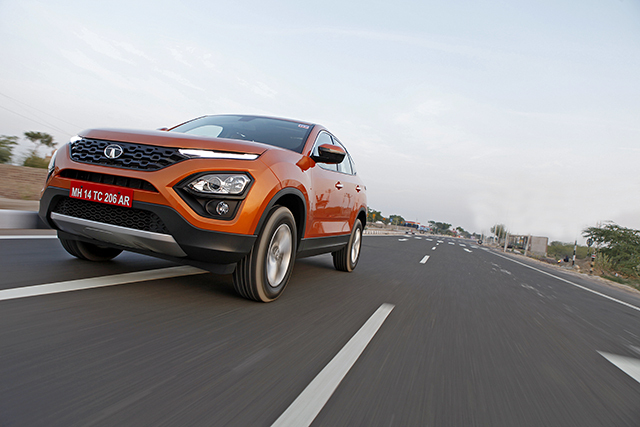 On the Tata Harrier, they get a 3D treatment, which along with the silver skid-plates and dual-tone bumper make the front design more striking. While we still explore the look, we can safely say that the side profile is the perfect angle to appreciate the design of the Harrier. 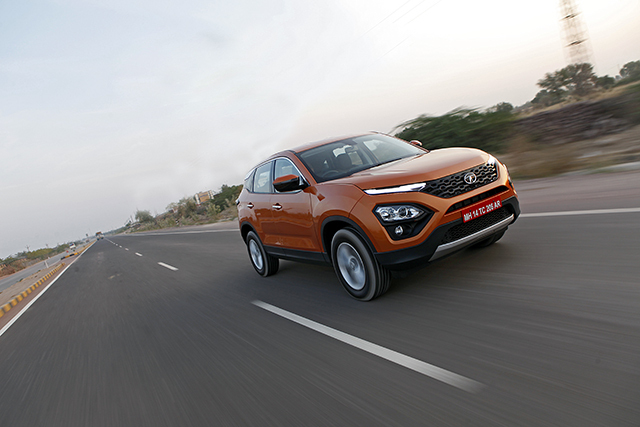 Its robust proportions, a floating roof with a silver embezzlement and the ‘Harrier’ stamp, and the black cladding running across the base of the car make this Tata quite a head-turner. 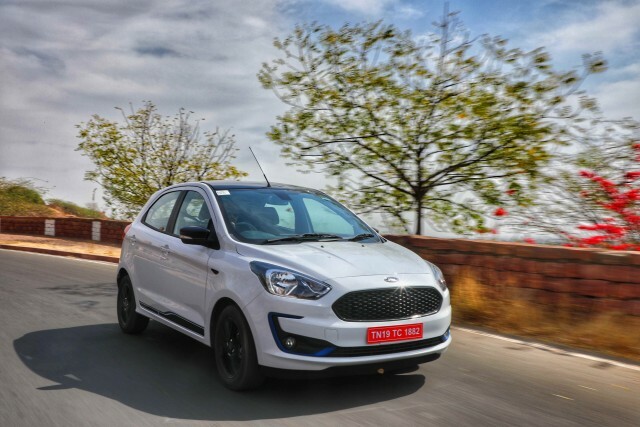 A set of vanilla-looking 17-inch alloys try to fill up the muscular wheel arches, though lager alloys would have done justice to the otherwise stylish design. But for the sake of ride comfort, the engineers had to opt for more forgiving and taller 235-65 R17 Goodyears. 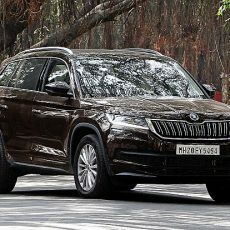 We hear that the company dealerships will offer 18-inch after-market wheels which will surely up the style quotient by a couple of notches. 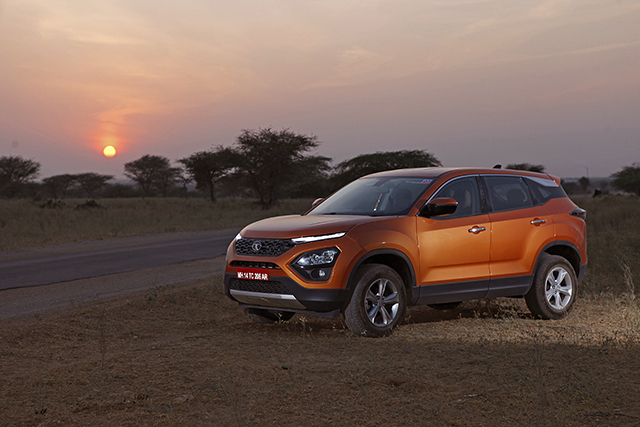 The rear design seems to be an unaltered version of the Concept H5X with a rather narrow windscreen and a set of neat-looking semi-LED tail-lamps. 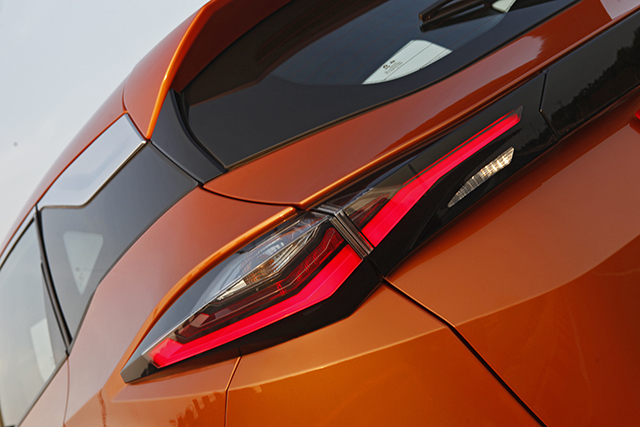 The black detailing of the tail-lamps merge with a piano-black strip on the boot lid. Interestingly, there’s only one ‘Harrier’ badging on the tail-gate and no other branding. The rear also gets a sliver skid-plate and a pair of faux exhaust outlets. 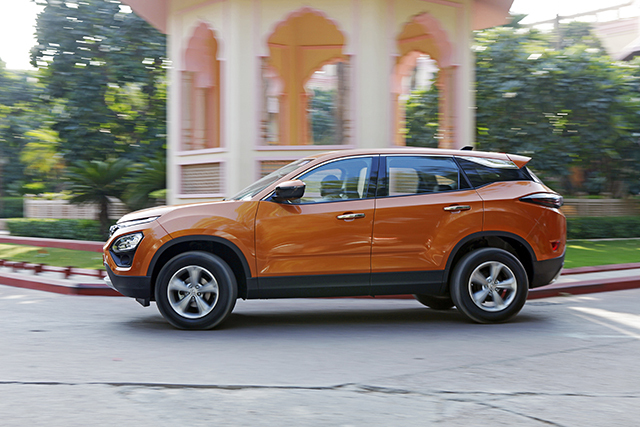 Overall, the SUV stands out in a crowd but the panel gaps, to our disappointment, are inconsistent which are a let down to the imposing design. In comparison, the cabin is far better executed in terms of craftsmanship. The layout is simple and elegant and materials hard to fault, but the cabin quality isn’t the best in the segment. You’ll appreciate the soft-touch Nappa leather-like material and the almost real wood-finish on the dashboard, which add a sense of richness to the cabin. 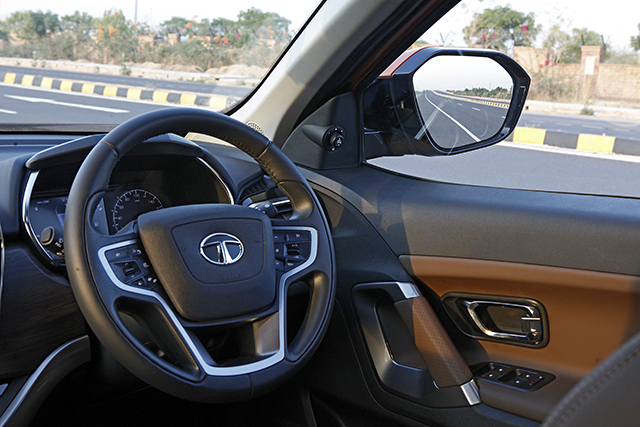 The 8.8-inch touchscreen, the centre a-c vents along with the control buttons form a single, floating unit. Also, the aero-throttle style parking brake is quite cool, which when disengaged, gives a flush-finish to the centre console. The only thing that falls short is the underwhelming design and finish of the steering wheel which can’t match up to the otherwise plush looking cabin. The saving grace is that it comes with tilt and telescopic adjustment. 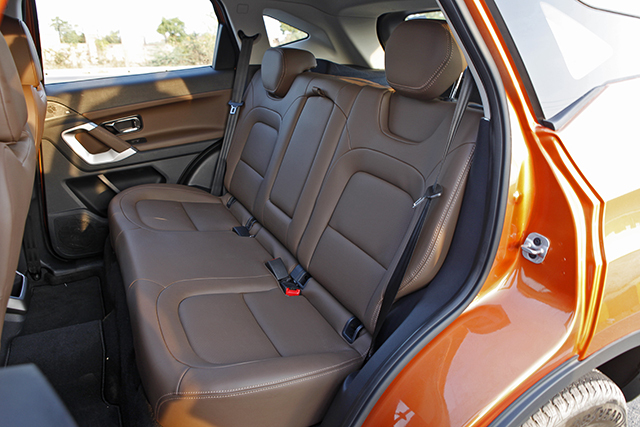 The solid looking door handles also come wrapped in brown leatherette, matching to the seat upholstery. The front seats, for an average built Indian, are fairly large and comfortable and come with adjustable lumbar support. Surprisingly, it misses out on features like a powered driver’s seat and height adjustable seat-belts. Storage, however, isn’t a problem. The front door panel has two bottle holders and even a small umbrella holder. 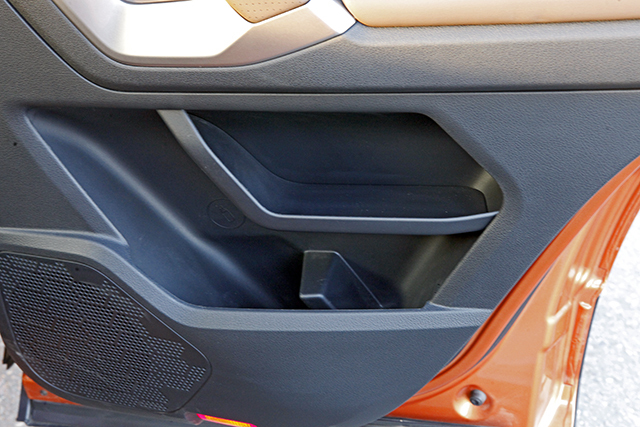 While the rear doors not just offer bottle holders but also storage for mobile phones. Despite being over 4.5-meters long (it’s even longer than the Compass) the Harrier is a five-seater. Clearly, space isn’t a problem. 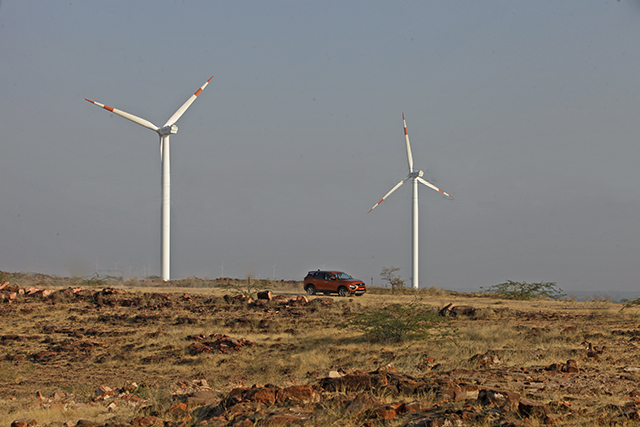 It has acres of cabin room making it a good chauffeur-driven car. The rear bench is flat and can comfortably accommodate three adults with ample shoulder- and head-room. 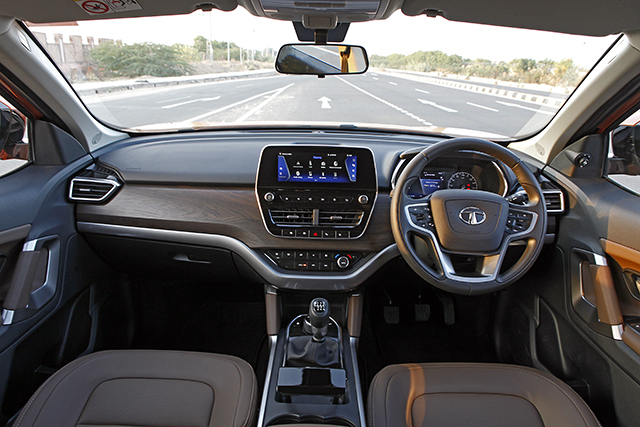 Aircon vents integrated into the B-pillars and a folding armrest with cup-holders make it a welcome place to be in. The large windows keep the cabin airy and bright, though we were surprised that even our top-spec test car doesn’t get a sunroof. 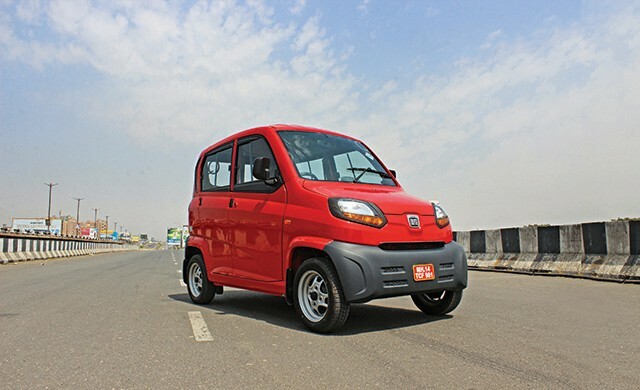 Some Tata executives hinted that the sunroof will be introduced in the life-cycle updates and a seven-seater version is also on the cards. 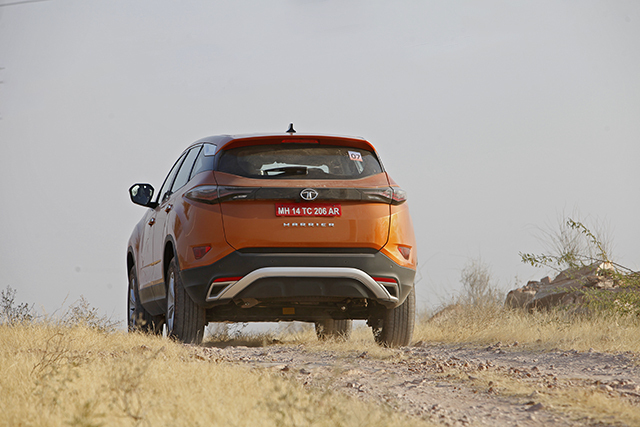 Like the Nexon, we felt the Harrier could do with better ergonomics. The large outer rearview mirror does take in the exterior proportions, but while driving it creates a massive blind-spot. So, one must peer over it at every round-about or while cornering. The earlier mentioned narrow rear windscreen further adds to the woes. Another issue I faced was while looking for the USB slots. There are a couple of them, but all tucked away from view, which makes them difficult to access. Lastly, a small niggle is that there isn’t any door unlock button either. The spare wheel has been positioned underneath the chassis which is a good and a bad thing. Bad because getting it out during a flat tyre will be a task. The good bit is that it frees up the entire 425-litre of luggage space. The storage cavity isn’t wide but deep and tall, so to completely utilise the space one will have to remove the large parcel tray. 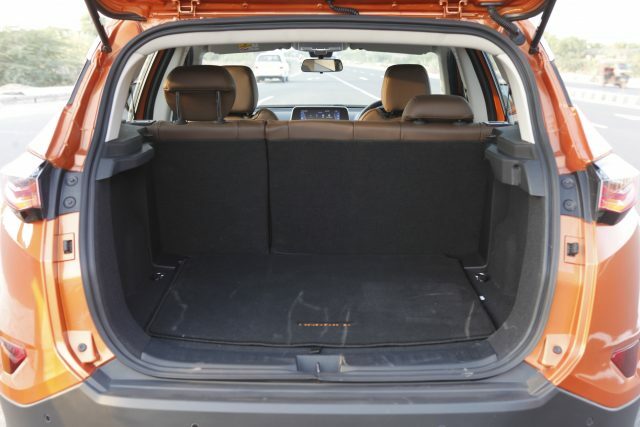 You can even tumble down the split-rear-seats to expand the storage space to a sizeable 810 litres. 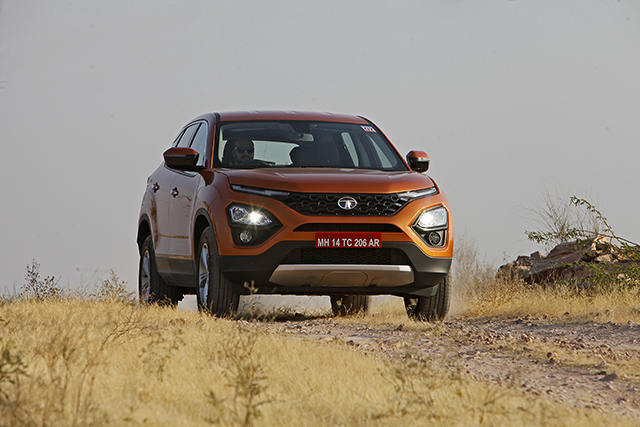 Since this is the most premium Tata offering, they’ve packed the Harrier with plenty of equipment. 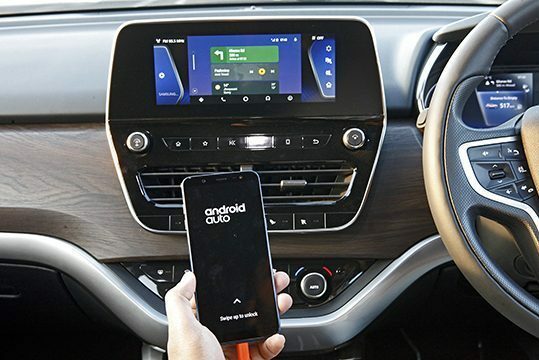 The touchscreen infotainment system gets the latest Tata interface and is compatible with Android Auto and Apple CarPlay. The system is better than the ones seen on Tata cars before but clearly not the most intuitive. 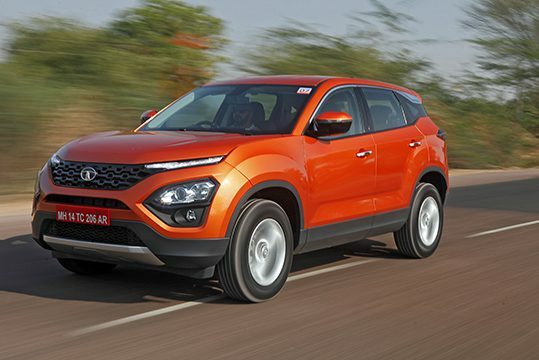 The SUV also comes with a rear camera, parking sensors, keyless entry and push-button start, auto-headlamps and wiper, cruise control, climate control and the front arm-rest conceals a cooled storage. These are things you’d expect from this segment of cars. What you’d love is the super sounding JBL music system with nine speakers, peace of mind of having six air-bags and interesting puddle lamp that project the Harrier silhouette on the ground. Filtering down from premium cars is the large 7-inch screen incorporated in the instrument cluster. It acts as an add-on to the 8.8-inch infotainment display and gives turn-by-turn navigation guidance right on the driver’s line of sight. 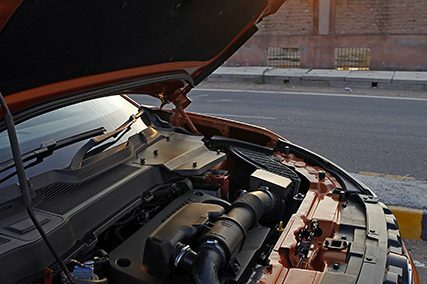 The screen on the instrument console also has various other nuggets of information like power and torque monitor, and in-depth fuel economy to name a few.